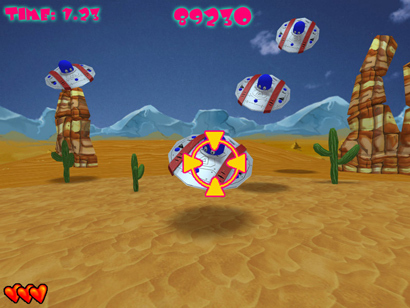 Do you like light gun games? Are you shocked and dismayed by light gun games that don't actually support use of light guns? Stay away from "Obliterate" then. If, like me, you were dropped on your head as a child and actually enjoy light gun games more when just using a crosshair and a standard controller, then you might get a few laughs here, although most of them will be at the expense of the ridiculous sound effects. 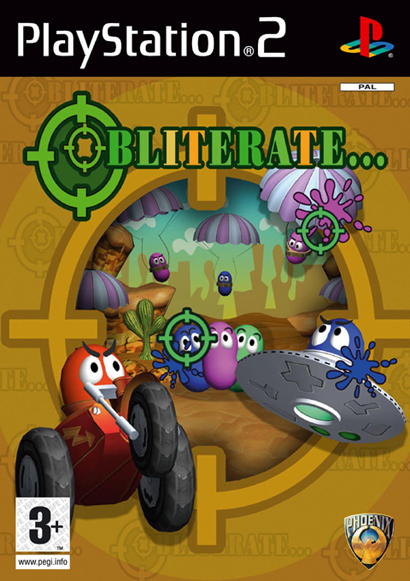 "Obliterate" is an attempt to cross the shooting minigames of "Point Blank" with an overarching plot and cutesy characters ala "Lemmings". Earth is under attack and only you can save the planet! Three worlds and 36 levels, each level being along the lines of "shoot X aliens before the time runs out", "defend the city by shooting all aliens", "only shoot the buses with aliens on them", etc, you get the idea. Wrinkles are thrown into the mix, for example, you'll get a message saying "don't shoot any of the blue ones from now on". To finish "story mode", you only need to complete three missions each "world", but "challenge mode" lets you play any you like. Graphics are certainly cute and functional enough - it could be argued that they're pretty good, really, even without considering the budget nature of the game. Yet again I'm confronted with an excellent tune, but it doesn't really seem to suit the nature of the game. On the bright side, there's actually full credits for the game in the manual - Mark Fitt, you're a great musician, keep up the good work.